I shared a picture recently on Instagram and I had TONS of questions wondering how I prep for a sub in less than 30 minutes. I'd love to share any tips I have because I remember spending HOURS on plans that most times didn't get followed. Before reading please know that my district doesn't have very many subs that are experienced teachers. We once in a while get lucky and are assigned a retired teacher, but that isn't often. I learned to keep things as simple as possible but with as many details as needed to get my kids where they needed to be safely. You should also know that I don't ever leave anything new that a sub would have to teach. I learned the hard way that a sub isn't always the best person to leave in charge of introducing new content. My first year I left new math lessons to do because I was out of town for a few days due to a family emergency. When I came back half my class hadn't learned the new content and half the class learned the concepts incorrectly. I was left to undo the damage. So most of the work is already done because of these bins! When I know I'm going to be out, I take a look over them and make sure that there is a varied choice of activities in there. So let's say I have plenty of resources for reading and writing, I might have to copy a quick math activity to mix things up. But it's usually no more than one or two things I will need to copy. If I don't have any time to copy, I ask my team if they have any math papers (or any other subject needed) left over and I'll use those. The next thing that saves me time is having my sub plans in my Google Drive. 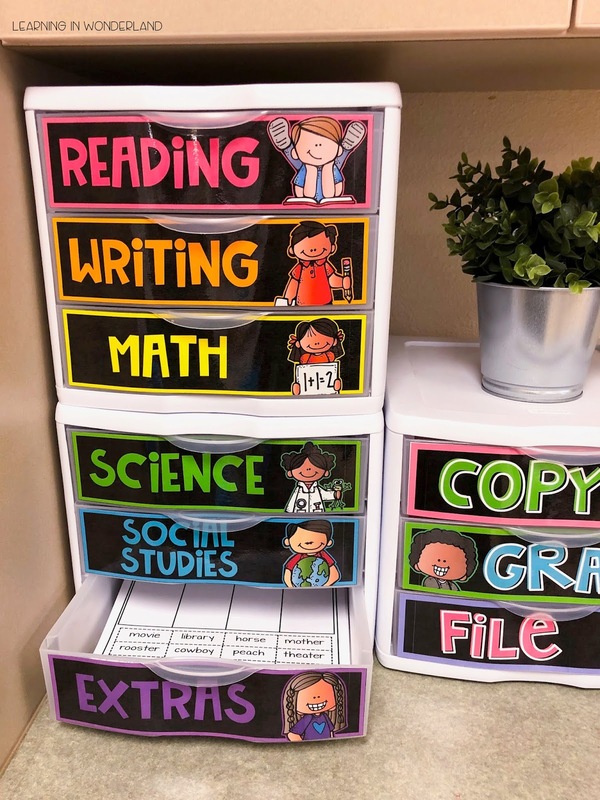 Helpers: students that know where everything is in your room, and how to work everything in your room; such as your document camera (if you want the sub using it) how to turn the projectors on and off, using Go-Noodle, etc. Most of the details are all done and filled in. I might have to touch them up to update our current specials class for the day and any current info about class jobs. I love having these plans saved in a Google Doc because they are available to me anywhere. When I first started teaching, I would write up these plans every single time I had to be gone. It would take me an hour just to write everything up again and I would forget crucial info! After a couple of years, I got smarter and started up a template in a Word Doc, but then I would lose that file in my computer or I ended up with 15 copies titled Sub Plans. Every time I was out I would have to spend so much time looking through every version of this file to update it. With Google Drive, I just have it as one document and there is no chance of me losing my plans. One of my best things to include on these plans are paperless activities. 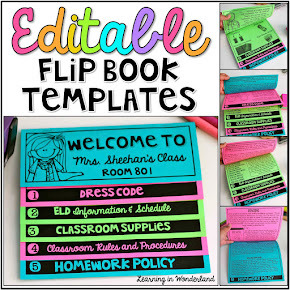 These activities don't require any copies at all and fill the day without wasting instructional time. Book Bins: One of my favorite paperless activities is independent reading. We use our book bins for that. I leave instructions for the sub to have the kids read on their own for a certain amount of time and then read with a partner for another length of time. Computer Lab: Our school purchased two programs the kids can use in the labs. Our class goes twice a week. If I know I'll be out, and it's not my lab day, I'll ask my friend next door if we can switch days. That's 45 minutes that my kids will get meaningful content without me having to prep for it. I do leave explicit directions to have the sub walk around so that the kids are on task the whole time. Journal Writing: We do journal writing every day. My kids know our routine. That is another 45 minutes of drawing, writing, and sharing time that is easy for anyone to implement. Read alouds: I leave plenty of books for the sub to read throughout the day. Something I have learned over the past 12 years is that kids love read alouds and they especially love them when a guest is there to read to them. As you can see, those activities right there take up a lot of time and are things that you'd want the kids to do whether you are there or not. Best of all, they don't require any planning or copies. I try to mix up those paperless activities from above with some seat work. As a newer teacher, I would painstakingly write out my plans detail by detail telling the sub which worksheet to do next only to come back and see that nothing was done as I intended. Now I schedule the seat work time in chunks. I write in about 40 minutes of seat work between the paperless activities. My directions are simple, I just say "Choose something from the work stack." I was wondering how subs would like that so I asked for feedback. The feedback I got was great! The subs said that they liked the freedom to chose what to do depending on how they saw the kids working. They enjoyed it. Some subs completed the work stack in the order that I left it in and some subs had fun with it and chose the activities that they wanted to complete with the kids. 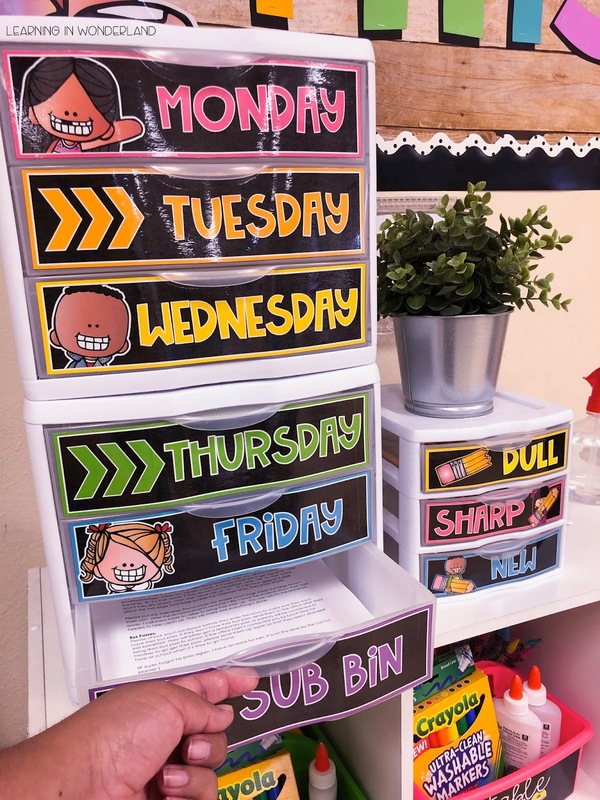 Since implementing these flexible plans, my subs have left great feedback saying how much they enjoyed subbing in my class and we often times have repeat subs because of this. What if I don't have time to plan at all? As long as you haven't been tossing your unused copies, that drawer should have plenty of stuff for a day. My friend next door can take out the stack and leave it ready for the sub. I then email or invite my friend on my Google Drive plans and she can print them out for me. (I always have a copy in there anyway but if I need to make some changes, I can just send them through a link.) If you have no copies in there, ask your team if they have anything to share. I can guarantee that each teacher will have one or two activities they can provide for your sub. Getting the skeleton plans done is the most time consuming thing when you first start out. Once you have that, you will have very minor things to change or touch up. So now, if I had to be out without any notice at all, it would take me a minute to pull everything out and another couple of minutes check the plans over (checking for helpers and any slight changes) and print that copy. I then set everything up on my table ready to go. A few years ago I saw teachers leaving a diagram on their tables directing the sub on where everything was. I decided to give it a try this time and I loved it. I left a question on my feedback form asking if the sub liked it and found it useful. She replied "this is beautifully organized! I look forward to subbing for you again!" Getting the actual sub stuff ready takes about 5-10 minutes. I then spend another 10-20 minutes tidying up and putting things away that I risk going missing. Things such as Scholastic book order money from my kids, locking up our tablets and Chromebooks, or expensive items that could get damaged and I would have to replace. I want to clarify that it's not that I don't trust the sub with our things. It's that sometimes subs have left my room unlocked overnight and on occasion, things have gone missing. Hope this helps! Please let me know if you have any questions! On the sub table, did you write those labels out, or is it a printable?